The man in the foreground of the photo is Rodney. At 25 years old, he is a second-year high school agriculture teacher. On the weekends, he works for local ranchers to support his now growing family. They live in a mobile home behind a truck depot in rural Kansas. You don’t see Rodney’s face because he is looking at his infant son in the photo. His son is laughing while rocking in a child’s indoor swing. You can see Rodney is laughing as well because his grin is visible over his shoulder. Artifacts from the past lift us out of the present moment. In much the same way, an artifact from the future can increase your imagination by releasing you from the contingencies of the present moment. Use them as an intervention to plan your business. The infant son in the photo is me. And this photo, an artifact from the past, has a great deal of meaning for me. As a father now, I look at it and emotionally connect to what it means in the present moment. Over the years it has meant different things. 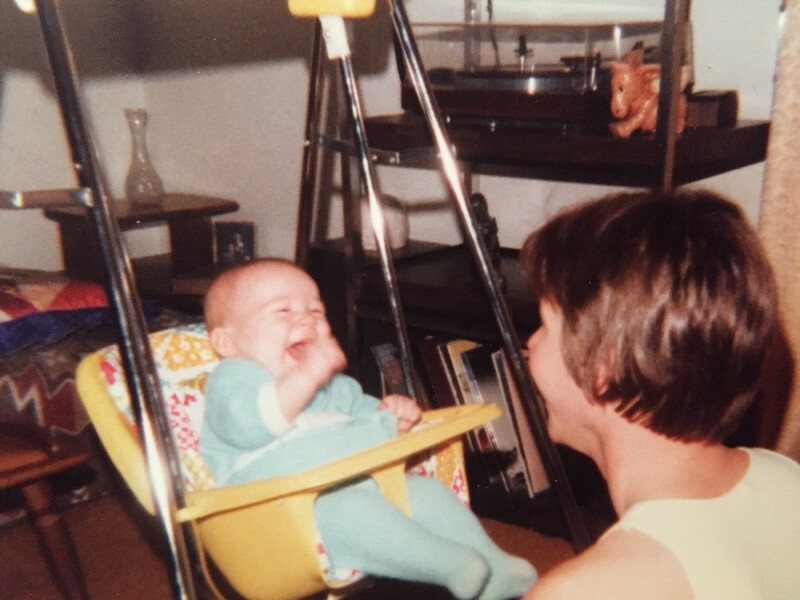 Today, it is a reminder to be joyful with my children, and I see that in the midst of extreme financial and professional pressure, my father found some moments to share happiness. This artifact does what artifacts are meant to do: They create an emotional meaning in the present moment, and they teach something. However, I recall none of this information I told you in the first paragraph. At least, not of myself. I have been instructed overtly and otherwise about what this photo means. And it has become a part of my identity in the present moment. If we think of artifacts in this way — as something that is designed to lift us out of the present moment, illicit emotion and teach us something — then we are free to construct also artifacts from the future. Why do this? Because the present moment (for most business owners) is mired in contingencies that do not allow for creative and productive thought. Each new idea needs a moment to breathe. And present-day challenges will starve it of oxygen. Setting your ideas in the future releases you from the present moment. So, I entreat you: Create a thing in the future with a quick exercise. Illustrate with words/photos the way your company will look and feel in 2026. How do customers feel? What are the greatest accomplishments? What are the biggest challenges? What is a day like? Create four separate scenarios and entreat stakeholders and leaders in your company to do the same. This is not an attempt to predict the future. Rather, these separate scenarios can be used as interventions to teach you something about the present moment. How did the scenarios make you feel? What new ideas were unlocked? What strategies can you begin to realize a preferred future? Constructing futures in the form of artifacts creates catalyzing moments for your business. And you can make your organization more agile and creative in the process. Check out the full article in the August issue of Small Business Monthly for simple steps to becoming mentally uncluttered.